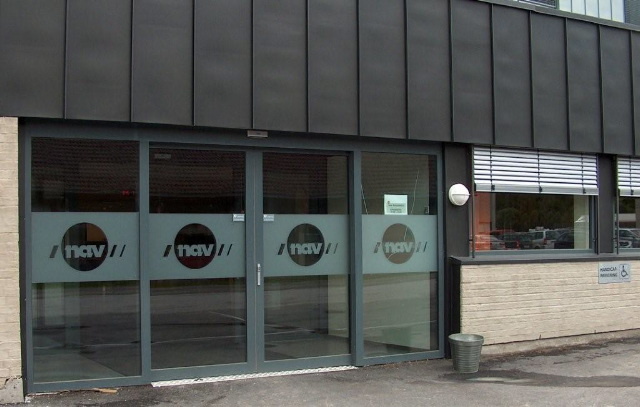 The NAV building is a newly constructed, publicly funded, three-story office building on the southeast corner of a former timber yard in the outer edge of Brumunddal center, Norway. Brumunddal is a small town located about 145 km North of Oslo and surrounded by scenic countryside and farmland along the shore of Mjøsa, Norway’s largest lake. The NAV building was completed in May 2009 in a bustling retail area and provides a variety of municipal social services with both public and administrative functions. They provide benefits and pensions (disability, sickness, old age, unemployment) as well as administer rehabilitation, job training, employment services etc. The services are provided on the municipal level, although all benefits are ultimately made possible by the central government. From the start, the NAV made a commitment to ensure that the the new building would reflect best practice in universal design. The NAV building is situated in a shopping area, which is approximately 14,000 m2 [150,694 square feet] and occupies the rest of the site. The structure was built in accordance with the national Norwegian requirements for accessibility laid down in the technical regulations of the Planning and Building Act of 1997. This building went beyond the standards of the state by incorporating Universal Design solutions throughout the plan, paying special attention to the usability of the building's public areas. The NAV organization has both public and administrative functions: the administrative component of NAV handles sensitive personal data and must be closed to the public. Public functions such as the job centre and various advisory services are therefore concentrated on the ground floor, while the NAV employees occupy the upper floors. Public funding required highly economical design solutions, building methods and use of materials. The corner site posed further problems due to its limited size and the fact that the building was going to have a different use than the majority of other buildings in the development. A Universal Design consultant and user groups were involved throughout the design stages. The main entrance from out of doors with a four automatic glass sliding doors edged in dark gray metal; each glass surface is marked with the NAV logo. Image of a small seating area with a low table and chairs and a high standing table between two corridors and adjacent to a spiral staircase. Floor markings delineate the space. Ramp allows for exit to be used by people using wheeled mobility. Contrasting column color and floor tiles aid in navigation for those with low vision. The NAV building offers a variety of public spaces on the first floor and accomodates a diverse group of people including job seekers, people getting or seeking various benefits, old age pensioners, all of whom have diverse needs. Additionally, the employees include all kinds of office workers also with a spectrum of individual needs. The building is both a workplace and a social services office. The latter function means that the public areas have to cater for a higher proportion of visitors with disabilities than the typical public building. This new construction also argued for equal attention to employee areas as the Norwegian public sector, in particular, is committed to increase the number of workers with disabilities. There is a bus stop near the building's main entrance, and parking spaces reserved for people with disabilities are provided in front of the entrance doors. Disabled employees may also have parking spaces reserved at the back of the building. These accommodations allow for a convenient approach to the building. A specialist consultant from the research facility SINTEFByggforsk was formally appointed to approve the drawings of the plan. The architectural detailing and choice of products were discussed with the consultant during the design and building process. The designers, architects, and planners also worked closely with representatives from various local user organizations during the design stages. This gave the potential users the opportunity to express their needs and expectations of the space to designers and specialist consultants. After the completion of the project a site visit by representative users with disabilities was organized to approve the finished building. The finished NAV building demonstrates that Universal Design goals can be met with simple and unobtrusive solutions within a restricted budget. The building also illustrates the benefits of an inclusive, cooperative design process that involves communitiy members and user experts working together. Given the client’s initial commitment upfront that this public building would meet a high degree of state-of-the-art inclusive design paired with a process of continuous design review, it is not surprising that the inclusive features are well integrated. In addition to the functional issues for people with disabilities, the common experiences of aging such as reduced visual acuity as well as reduced motor, dexterity and flexibility were given appropriate attention in this project for both employees and clients. Usability for visually impaired people received particular attention. Floor markings and color coding were systematically applied throughout the building to effectively communicate necessary information about the spaces to people with low vision. Additionally, inherent flexibility in the design of office furniture specified for the project gave them the ability to customize workstations for each employee throughout the office based not just on a clear functional limitation but on personal preference. All solutions were chosen with low cost as a priority. The building functions well and appears very satisfactory to clients and to staff. In a future project, elevating the public building challenge to balance cost, universal design, environmental sustainability and innovative design might be worth pursuing. All free-standing columns are in contrasting colors and the flooring material around the base of the columns has a darker color than the rest of the floor. This helps to signal the location of the structures and guide the users through the space, while adding an aesthetically pleasing brightness to the interiors. The seating areas are encircled by the office corridors, and the floor markings delineate the space and set a border between the seating space and the spiral stair. These features are used as signaling devices to make the space simple and intuitive for the variety of users who will occupy the space. The mat at the entrance of the NAV building provides color contrast, leads visitors to the reception desks and marks the waiting area. Every office has adjustable desks. Universally designed, emphasizing flexibility, furniture is required by law in all state and municipal buildings. Each corridor has its own specific wall color and floor markings. The darker colors of the flooring material that runs along the walls breaks at each office door. These colors signal to the users their location, to prevent them from getting lost in spaces that may otherwise look similar to one another. It also differentiates the space in the hallways.